Shayla Who? : beijing de gushi: what i wore. 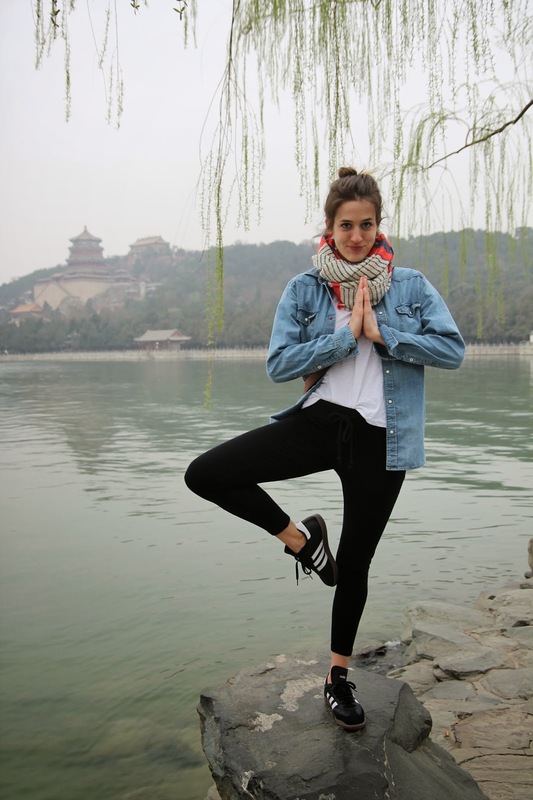 this little post is just a quick roundup of all the outfits i wore in china. i stress about packing, always. i feel like i need options! how heavy a coat should i bring? should i bring a coat at all? what if it's muddy? what if it rains? what if this? what if that? forever & ever. so i usually end up feeling like i packed all the wrong stuff, & completely wrong clothes for the things we go do, & this time was no different. but something that makes packing slightly easier for me is this: about a week before packing, i try to create a kind of an outfit theme for the trip, so then all week i can envision & then list the stuff from that vision i could pack, & limit it to 3 to 5 colors (sometimes it can be difficult to accomplish both of these, & of course these rules aren't hard-&-fast). so for example, in europe two summers ago when we went for some of ben's conferences, i was going for a really light, patterned, almost mediterranean feel for my outfits, & i tried to stick to blues, mints, silvers, & blacks. so instead of feeling like i had to wade through an entire closet of overwhelmingness, it was not as time-consuming or stressful because i had a specific vision in mind, & could easily pick out items i felt fit this mold. & then the color scheme helps so that when on your trip, it's easy to mix & match things the entire time because everything more or less matches with everything else. we were in europe for three weeks & i was able to rewear things & create new outfits...so not as much needed to be packed! it's a system i've found to work pretty well for me. wow. i'm reading over this & it's definitely a lot of rambling & it's pretty nonsensical, but you can see some of the things i wore (& re-wore) in europe here, here, here, & here (& then in rome it was just too hot for anything so i wore jogging clothes, as evidenced here). in london i was wearing a lot of black, silver, plaid, & chambray all buttoned-up & tucked in & with riding boots almost every day. although i pretty much wore a puffy coat the whole time because it was freezing thurrr, you can see some of that pattern here & here. day one: hat: j. crew, sweatshirt: h&m (men's section! ), belt: madewell, jeans: zara, shoes: vans, camera bag: ONA. day two: scarf & sunglasses: madewell, shirt: gap (that i can't seem to find on their site? ), pants: forever 21, denim top: h&m (men's section! ), bag, belt, & shoes mentioned above. day three: another gap white shirt, h&m denim shirt over it (men's section!...are you spotting a trend? a lot of women's shirts at stores are just too thin & too short in the arms & torso for me. men's shirts always, always fit better), leggings: target, shoes: samba, bag & scarf mentioned above, etc etc. 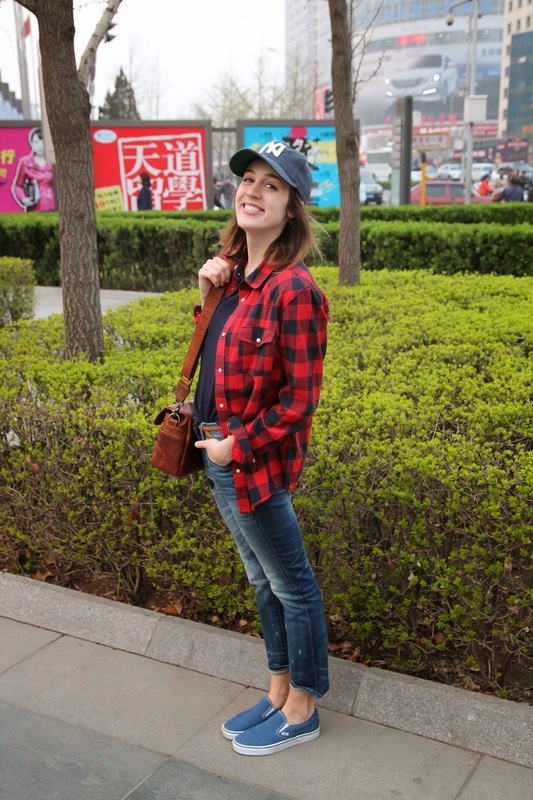 day five (day four was our great wall china hike, clothes not terribly exciting that day): blue shirt: gap, button up: h&m, jeans: madewell, hat, shoes, bag, belt all above. so cool boyish chic...not trying hard ...chic. love these pictures, thanks for posting!